Posted by Carolyn Murray Greer	| October 22, 2017 | Categories: Alabama, Carolyn Murray Greer, Remembering the Shoals, Revolutionary War | Tags: Captain Tisho Mingo, Carolyn Murray Greer, Remembering the Shoals, Revolutionary Soldiers in Alabama | Comments Off on Tishomngo, does that name sound familiar? Colonel James Martin Isbell was a noted local historian and author. James Martin Isbell was the son of Thomas Isbell and Lucinda Petty.James Martin Isbell was a grandson of Thomas Isbell and Discretion Howard Isbell. James Martin Isbell married Sarah Louise Horton, daughter of David Eagles Horton and Sarah Jane Dula Horton. Sarah Louise Horton was the granddaughter of Nathan and Elizabeth Eagles Horton on her paternal side. She was the granddaughter of William S. Dula and Theodosia Beasley Dula on her maternal side. Sarah Louise Horton Isbell was a second cousin of Tom Dula (Dooley) who was tracked down and captured by Colonel James Martin Isbell for the murder of Laura Foster. 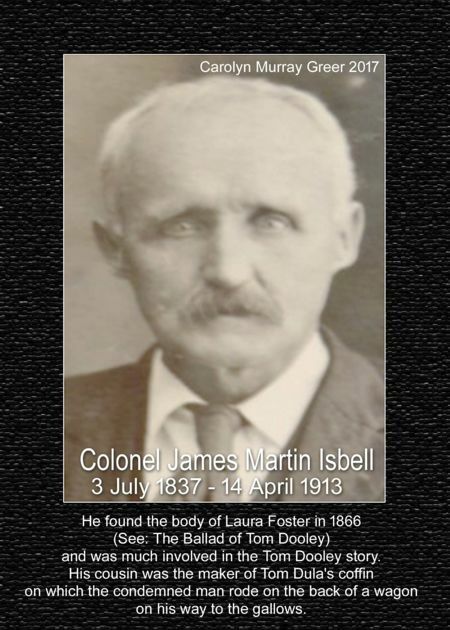 Colonel James Martin Isbell had previously led the search which located the body of Laura Foster. The song about Tom Dooley has been revived a couple of times over the decades, the most famous version being sung by The Kingston Trio; it was entitled Hang Down Your Head Tom Dooley. The ballad was number one for one week in 1958. It has been re-recorded by many singers since. Colonel James Martin Isbell was a second cousin of Col. Thomas Charles Land (1828-1912), who wrote the Ballad of Tom Dula (also known as “Hang Down Your Head, Tom Dooley”), and his brother Linville Land who made the coffins of both Laura Foster and Tom Dula. Tom Dula was a grand-nephew of the John Dula who got into a brawl with Thomas Isbell, grandfather of Colonel James Martin Isbell, on28 November28, 1796, during which Dula bit off Tom Isbell’s earlobe. Colonel James Martin Isbell is cited as an authority in many local histories, pioneer North Carolina and Virginia accounts as well as several family histories. He is cited throughout records and newspaper articles of the Tom Dula murder trial, consistently referred to as Col. James M. Isbell. Footnote 5: In the same book is the statement of James M. Isbell to J.P.A. in May, 1909, at latter’s home. Footnote 6: It [meaning the cabin of Benjamin Howard] “could still be seen, a few years ago, at the foot of a range of hills some seven and a half miles above Wilkesboro, in Wilkes county.” Thwaites’ “Daniel Boone,” p.78. 1885: The LENOIR TOPIC, 1(?) October 1885, p.4, printed a letter from W.E. White about Daniel Boone’s life in the Yadkin Valley area, which included, “Col. James Isbell, of King’s Creek township(,) could perhaps say something concerning Godfrey Isbell and Pendleton Isbell who were pioneers and also soldiers of Col. Cleveland’s command.” Godfrey Isbell had been bondsman at the marriage of Col. James Isbell’s grandfather Thomas Isbell to Discretion Howard. Daniel Boone: Master of the Wilderness (1939), by John Bakeless, p. 438, footnote 32.2 gives a footnote citation as follows about the cabin and Burrell’s account of it: “Burrell, the old slave, told the story to Col. James Martin Isbell, of King’s Creek, N. C. Col. Isbell’s grandmother, Mrs. Jordan Councill, daughter of Burrell’s owner, verified the story. She had herself known Daniel Boone. Mrs. Jordan Councill was the former Sarah Howard, sister of James Martin Isbell’s grandmother. Mrs Sarah Howard Councill was Col.James Martin Isbell’s great-aunt. Thomas Isbell and Lucinda Petty Isbell household is listed in the 1850 Federal Census record for Caldwell County, North Carolina. The census shows the parents of James Isbell, age 13. According to the census, the parents were Thomas Isbell, b. circa 1800 in N.C. and Luncinda Isbell, b. circa 1811 in N.C.
James M. Isbell was Captain of Company A, 22nd N.C. Regiment. Three sons of John and Frances Knight Land (James, Thomas, & John) served under him until he was wounded and discharged. He was also a witness in Tom Land’s Confederate pension application, filed in east Tennessee. Service Record: Commissioned an officer in Company A, North Carolina 22nd :Infantry Regiment on 30 Apr 1861. Mustered out on 15 Jul 1861. Regiment on 09 Aug 1861. Promoted to Full Captain on 31 May 1862. Promoted to Full 1st Lieutenant on 01 May 1862. Mustered out on 13 Oct 1862. Event Place: Morganton, Burke, N. C.
Burial Place: Caldwell Co., N. C.
Birthplace: Caldwell Co., N. C.
James M. Isbell and Sarah Louise Horton Isbell are still head of household in the 1910 Census for Kings Creek, Caldwell County, North Carolina. They still have some children residing with them. His wife, Sarah Horton Isbell, died in Jan. 1919 and the death certificate stated she was a widow. His wife’s death certificate stated burial at Isbell Cemetery. The joint tombstone of Colonel James Martin Isbell and wife Saray Horton Isbell’s grave is at Grandin Baptist Church Cemetery. The Tragic Death of little Grace Arrants, adopted daughter of Estelle Peebles Arrant…. ENTIRE FAMILIES PERISH AS PARENTS AND CHILDREN BATTLE TO REACH EXITS. MANY LEAP FROM ROOF WHEN OVERTURNING OF A LAMP ON STAGE AT ENTERTAINMENT PRECIPITATES FIRE AND MAD PANIC. SOUTH CAROLINA SCHOOL HOUSE FUNERAL PYRE FOR COMMUNITY. Camden, S. C., May 18 — Seventy-four persons, many of them school children, lost their lives last night in a ghastly fire which swept through a country school house six miles south of here. They were burned, suffocated and trampled to death in a mad, terrified scramble for the one exit that led from the top floor of the flimsy wooden structure. Death List Expected To Grow. Perhaps a score of others are so badly burned they may die, and many who were successful in their frenzied dash for the stairway are suffering from injuries or varying degrees of seriousness. The terrible tragedy occurred at what is known as the Cleveland School. Those who escaped today told the horror details of a night of horror. Between 150 and 200 persons were gathered in the school house for graduation exercises. The school house was of the old fashioned country, wooden type, with a stairway in the rear and lighted only with kerosene lamps, located in a comparatively isolated community with no other houses or building nearby. The audience was made up of fathers, mothers and children, the latter dressed in their “Sunday best” for the biggest community event of the year. About 10:00 P. M. after most of the exercises had been completed and the superintendent of schools was presenting the ribbon-bound diplomas to the graduates of the eighth grade, there was a terrific explosion. It came from a smoky kerosene lamp swinging in the rear of the hall from the ceiling. Burning oil was scattered over the back part of the big square room and flames appeared instantaneously, catching readily at the dry wood. The only staircase was in the rear and almost before those in the room realized what had happened escape was virtually cut off. The flames immediately surrounded the stairway. Leap From Windows. Those in the rear of the room dashed through the blinding smoke and jumped from the windows to safety below. Those nearest the platform and in the front seats of the hall were not so fortunate. With no windows from the platform and the smoke and confusion growing worse every second, there resulted a mad, terrified scramble for the one hope — the stairs. It was sheer panic and it paid the usual price of panic. Women and children, gay in their white graduation costumes were knocked down and trampled under foot ant the interior of the hall became in a few minutes a screaming, milling mass of horror-stricken people, intent upon but one thing — escape. Some of those who escaped said later the doors of the auditorium “opened the wrong way,” and that a score of persons got jammed against a closed door and thus held up escape for many. Warning Ignored. The Superintendent of Schols[sic], on the stage with diplomas in his arms, made a futile attempt to stem the tide of panic. He shouted that all could get out safely, if they took their time, but his voice was lost in the screams of the women and the children. The superintendent and those of the graduating class, being furthest from the stairway, are believed to have perished. The flames spread through the dry wooden building with almost unbelievable speed. Within a few moments after the explosion the whole rear portion was blazing high, and the flames, fanned by a stiff wind, began to eat into the flooring. 70 In Inferno. Then, the second floor collapsed and down into that raging inferno of fire and burning embers went all who were left — established at about 70 persons. The first of hose who escaped by jumping out of the windows dashed across fields for the nearest farm houses for telephones by which to summon aid. Practically the whole countryside was at the school house, however, and some houses were locked. Telephones are not many any way, in the community. Camden finally was notified and chemical fire apparatus was sent on the run. When it arrived it was too late — the school house was a mass of burning embers, smoking and black — the funeral pyre of half this little community. When the Camden firemen arrived they looked upon the mass of ruins around which stood weeping mothers, frantic fathers and wailing children, looking for their loved ones. There were a score of persons lying groaning on the ground, suffering from broken limbs and fractures suffered in leaping from the windows. Night Of Terror. The darkness was lighted only by the ruddy glow of the smouldering fire and in the intense heat and amid confusion the work of finding out who had escaped and who had died continued throughout the night. Dawn this morning found a wearied, blackened crowd on men working feverishly. At 8 o’clock they had succeeded in pulling 74 bodies from the ruins. The work of identification has not been completed because of the confusion and the stunned condition of those who escaped. Several whole families, however, have been wiped out. “There was no one to blame,” said the chief of police here. “It all happened so quickly and the panic was natural.” All of the victims were either graduates, students of the little school or parents and friends. Posted by Carolyn Murray Greer	| September 9, 2017 | Categories: Remembering the Shoals | Tags: Carolyn Murray Greer, Cleveland School Fire 1923, Estelle Peebles Arrant, Grace Arrants, Peebles, Remembering the Shoalls | Comments Off on The Tragic Death of little Grace Arrants, adopted daughter of Estelle Peebles Arrant…. Thomas Lewellyn Looney was born about 1718 on the Isle of Man. He was the oldest son of Robert Looney and Elizabeth Llewellyn.He immigrated to Pennsylvania with his parents and into Virginia when they moved to Virginia circa 1740. He passed away about 1760. Thomas Looney was reported killed during an attack by Shawnee Indians who raided the settlement in early 1746. There was a petition on behalf of Margaret Lundey [Looney] that informed the court that her clothes had been taken by David Logan, Constable on attachment vs. her deceased husband Thomas Lundey [Looney] as suit of Daniel Harriss, be returned. Since Lundey is not a name that appears in any of the printed abstracts of Augusta County, the correct name must have been Looney. The probate record for Thomas Looney was published on 19 Nov 1760 in Augusta County, Virginia. Another source for this information states that David Looney was made administrator of Thomas Looney’s estate on the same date. At the same time, David Looney was appointed administrator of Daniel Looney and Peter Looney’s estates. The reports of his estate being brought into the legal court system, may have no indication of his true date of death. In the Looney family along there are many recordings of the brothers and close kin being killed or were taken off by the indians. is our first known immigrant ancestor with the surname of Menefee. Carolyn Murray Greer wrote this biography which is posted on WikiTree for the progenitor of the Menefee family…which extends down to Giles County, Tennessee and into northern Alabama. His death date is given as 1646 in records I have researched. The name Menefee has had numerous spelling variations over the centuries. Some spelled the name: Minife, Minefie, Minifye, Menifye and other variations of the surname, but the most prevalent spelling has become the surname written as Menefee. Those Menefee men were important people to lend their name to the history and the formation of this country, the great United States of America. First settled by the English colonists in 1607 at Jamestown in the Virginia Colony, the County was formally created in 1634 as James City Shire by order of King Charles I. James City County is considered one of only five original shires of Virginia to still be extant today in essentially the same political form. To further information on his immigration to America, George Menifie, who was born in 1596 or 1597, came to Virginia in 1623 on the Samuell from Wiltshire, England. George Menefee is listed as counted among the living in James City on the first census taken in February of the year 1623. This first census was taken after the 1622 great Indian massacre who took the lives of a quarter of the 1,240 inhabitants within an hour of the start of the bloody ordeal. George Minify was listed among those in the VA Early Census Index in 1624. He lived in Virginia Pioneer Township, James City County in Virginia. George was born about 1596. George Menefee passed away in 1646. George Menefee was responsible for bringing over immigrants from England and with each sponsorship he received a grant of land. In 1639 George Menefee sponsored William Minifie to be brought over to Charles City with a large group of people, and George received a bounty land warrant of acreage in Charles City. George Menifie arrived in Virginia in 1623, was Burgess for James City County, 1629, and member of the Council, 1635-1646.He was one the wealthiest men of his day in the Colony, and was probably the leading merchant. In 1634 he lived at “Littleton,” or “Littletown,”‘ not far below Jamestown.His large garden here ” contained fruits of Holland and Roses of Provence.” His orchard was planted with apple, pear and cherry trees, and peach trees. George Menifie introduced the first peach trees to America as he cultivated the first peach trees.Around the house grew, in the fashion of the times, rosemary, thyme, and marjoram.He took a prominent part in the deposition of Governor Harvey. Later he removed to “Buckland,” an estate of 8,ooo acres in Charles City County. His only child, Elizabeth Menifie, married Captain Henry Perry of Charles City County. Captain Perry was a member of the Council. They left two daughters and co-heiresses. Daughter Elizabeth Perry married John Coggs, gentleman, of Rainslip, Middlesex, Esq. Daughter Mary Perry married Thomas Mercer, stationer, of London. Mr. George Menifye: the indian was examined and found to have been well instructed in the principles of religion, taught to read, instructed to writing: and whereas there hath formerly been given by will, a stock of three hundred pounds sterling by Nicholas Farrar, late of London, Merchant, deceased, by [for?] the Indians, whereof 24 pounds sterling was yearly to be paid to any person that should bring up three of the indian children the said Mr. Menifye for his better supportation in the education of the said indian boy desire certificate from the court of the bringing him up and instructing him in christian religion as is said: the governor and council approving and commending the care that hath been used towards this youth have condescended to the request of the said Mr. Menifye and have thought goo to recommend hereby his suit for the allowance of 8 pounds per annum, part of the said 24 pounds. towards the maintenande the said youth and to that purpose in testimony of the premises have thought good to cause the seal of the colony to be hereunto affixed.Given at James city the tenth day of June, a domini 1640. The site of old Westover Church, near the house at “Westover,” still contains a number of tombs formerly in or near the old building. The name John James supplies information as to one of the early ministers of the parish. John Bishop was an early resident of Charles City County, as was Walter Aston. Howell Price was once clerk of the county. Virginia Council, 1641. George Menefye was present at Court held at James City October 13, 1641. Those in attendance were:Sir Francis Wyat, Knt., Governor, Captain John West, Captain Wm. Pierce, Mr. George Menefye, Mr. Wm. Brocas, Mr. Amb. Harmer, Mr. Richmond Bennet. […]The area of the plat of John Harvey being given, also its northern boundary. Back Street, its eastern boundary “the Swamp lying on the East side of the said New Towne,” its southern boundary, **upon the highway close to the banke of the Main river, the approximate position of the tract was ascer- tained after several trials. From the descriptions of the Harvey and Hamor tracts the position of those of George Menefy J and Richard Stephens, and also those of the two cross streets, all of which are men- tioned in the descriptions of the two first named, were readily found, and finally the tract of John Chew, all as shown on the Map of lames City, Va., 1607-1698. GEORGE MENEFIE of Buckland in Virginia, Esquire.Will 31 December 1645; proved 25 February 1646-7.To be buried at discretion of my wife in parish Church of Weston [Westover]. All debts in Virginia to be satisfied.All Tobacco or money debts in England to be transferred to my books, “The shipp Desire now Iyeinge before Buckland may with all possible expedition be dispatched way for England, and to bee part loaded with what Tobacco is ready here above, and receive the remainder of her ladeinge belowe, vizt, tooe hundred Hoggsheads on the partable account” 100 hoggshead my own account and the rest by discretion of a note to be found in a small book of tobacco shipped and to be shipped. My 100 hogsheads and my part in the ship Desire and cargo, and my 1-16 part of the William and George be consigned to Captain Peter Andrews, he to give an exact account to my heirs and executors. To my daughter Elizabeth Menefie all my land at Weston, att James Citty, and at Yorke River. To my brother John Bishopp, the money he owes me, and one-third part of my crop of Tobacco made the last summer at my plantation of Buckland. My sheep at Buckland to be a joint stock between my daughter Elizabeth, and son-in-law Henry Perry. To Mr. Jo. James £20 and 1000 lbs of Tobacco, he to preach a sermon at my funeral. To Mr. Jo. Converse, Chirurgeon, 2000 lbs of Tobacco. To my brother Roger Booker £50, he to assist Humphrey Lister in collecting my debts. To Jo. White, Merchant, £50, provided he continue one year longer in Virginia and collect my debts as formerly. Tobacco not able to go in the Desire to be sent in the Flower of London Goods consigned in the William and George to be returned in Kind. Everything to my wife and daughter.Executrix and guardian to my daughter; my wife Mary. Tobacco due to me from Captaine Tho. Varvell shall be Satisfied by Walter Aston. Satisfaction to be made to Mr. Humfrey Adlington for his care in my business concerning Chamberlaine, by Captaine Peter Andrews. Overseers friends Captain Peter Andrews, Richard Bennett, Esq. Witnesses Howell Prise, Hunifrey Lister.Fines, 31. ↑ Source Bibliography: JESTER, ANNIE LASH, and MARTHA WOODROOF HIDEN. “Musters of the Inhabitants in Virginia 1624/1625.” In Adventurers of Purse and Person; Virginia, 1607-1625. N.p. : Order of First Families of Virginia, 1607-1620 [Princeton University Press], 1956, pp. 5-69. ↑ The Virginia Council & General Court Records 1640-1641 From Robinson’s notes, Virginia Historical Society Collection. ↑ Virginia Land Patent Record, Book I, p. 3. t /did, Book I, p. 5. J /did, Book I, p. 4.
has been written in parts by Beth Terry Murray. She has approved our posting some of them here. They will come in the parts as written. Enjoy. I should mention here that most people remember him being called Wilbo or as his family called him “Bo”. We had been living in a house next door to my Uncle Glen and Aunt Stella, I loved it because I got to see my cousin Pam every day and there were kids around the neighborhood that we saw all the time. In that house we slept on a sleep porch at the back, my daddy and Ricky slept in a full size bed at the very end of the porch, then I slept in a baby bed that was turned to touch the foot of their bed, and my mother slept in a half bed that touched the end of the baby bed. Yes…..from what I remember I slept in that baby bed until we moved into our new house in 1961, where I had my own bedroom with a new bedroom suit. Mother had inherited 4 1\2 acres when her parents died and my daddy had bought one of her sisters 4 1\2 acres which then meant he had 9 acres. I really didn’t know what exactly that meant, but I knew by the smile on his face that it meant a lot to him. He bought me and my brother Shetland Ponies and himself several Black Angus Cows. Now the cows were by no means a huge herd, but it was his dream to have something that belonged to him and his own family that he could love and knew would always be there for him. I never doubted for one minute that he loved me and would have done anything for me. As a matter of fact, I remember when we were studying how to tell time in school. I could not get the hang of it and when the teacher would give us a test on clocks I would break out in a cold sweat. My daddy knew I couldn’t read clocks so he took off work 1\2 a day when I was out of school. He went into his and mother’s bedroom and got his Big Ben alarm clock and sat with me all afternoon until the light went on over my head and I had the hang of it. His mother moved to Town Creek when I was about 8 years old, and he treated her as if she had never left. By the time she came home my grandfather Tom had been killed in Leighton at a little store he managed. A man had come in late one night and stabbed him to death. When Mama Terry moved back to Town Creek it was as if she never left, daddy went to see her every morning before he went to work. His work consisted of being a meter reader for the gas department, I know he would mention wanting a higher paying job periodically, but with the one he had he got to talk to people and that was something he loved to do. He came into my bedroom every Sunday morning and read the comic paper to me, in a very deep voice. To my knowledge he never culled anybody, no one was beneath him or better than him. He never met a stranger and he helped anyone that he saw in need. He called the brothers and sisters that lived out of town to schedule vacations and to let them know when they were expected to be home. I can assure you if Bo wanted you at home at that time, then you were home. The brothers and sisters would fish and sit around and talk about all the old times. Most of the kids would sit there and listen as long as we could, at least until the mosquito’s came out. John Birdwell is one of my heroes and ancestors. John Birdwell led a very storied life. He is the son of George Birdwell and Mary L Looney Birdwell. His father was a Revolutionary War Patriot. He is likely one of yours, too, if your surnames include Allen, Looney, Harmon, Isbell, Murray, Birdwell, Gregory, Sparks, Lenz, and a myriad of others. The featured image is where John Birdwell’s property was located in Mississippi Territory, later Madison County, Alabama. He owned property in Tennessee, and in the counties of Madison, Lawrence, Franklin County, and Fayette County, Alabama. He also owned property in Texas, Rusk County and possibly Nacogdoches County. John Birdwell was born in the Bent of the James River (sound familiar Peebles family?) on 24 Sep 1770. He lived and owned property in the states of Tennessee, Alabama, and Texas. He died at Mt Enterprise, Rusk County, Texas on 16 Feb 1854 at the home of his son, Allen Birdwell. The account of his death is tragic. A family history states that John Birdwell moved to Nacogdoches County in 1838 and “lived at Old North Church two years,” then moved twelve miles to Mt. Enterprise in what became Rusk County when Rusk was formed from part of Nacogdoches. John Birdwell signed his will Jan. 24, 1854, and it was entered in Probate Court April 27, 1854.Will is provided as image in this narrative. John Birdwell died Feb. 16, 1854. The estate included $1,400 cash and included slaves and possibly other property since Col. Allen B. Birdwell posted a $4,000 bond with the Rusk County Probate Court to serve as administrator of his father’s estate, a considerable bond in those days. FIRST FAMILIES OF TENNESSEE Descendants of John and Mary Birdwell are eligible for membership in the First Families of Tennessee, First Families of Alabama, the Sons of the Republic of Texas, and the Daughters of the Republic of Texas. 1770 John Birdwell and Mary Allen grew up in Sullivan County, N.C., which later became Sullivan County, Tennessee. They married and lived there several years before moving to Alabama. 1781 John Birdwell (born 1770 Virginia, died 1854 Texas) and wife Mary Allen… in 1781 were in Sullivan County, North Carolina (now Tennessee), 1809 Madison County, Alabama; 1819 Lawrence County, Alabama. FIRST FAMILIES OF ALABAMA 1805 The Birdwells settled in Madison County, Alabama in 1805, where they were charter members of the Enon Baptist Church which later became First Baptist Church of Huntsville. John Birdwell was the first clerk. (Alabama Historical Society marker in Marshall County lists their daughter “Sarah Birdwell Isbell, one of the earliest settlers of Madison County, 1805.” His son Allen Birdwell stated in his ledger that his parents took him to Alabama in 1805, when he was three years old). 1810 Enon Baptist Church Records, Sept. 1, 1810: September 1st Saturday–1810 The Church met and after proceeded to business– 1st Opened a door for the reception of member– 2nd the church took up a reference from last meeting and laid it over till next meeting– 3rd The Church agree to delegate Bros. Hellums, Childress and Birdwell to The Association. 1818 Madison Co. DB E, p. 133 #500: item 500: dated 8-18-1818 Grantor, John & Mary Birdwell Grantee, George Oglethorpe Gilmer For the sum of $3300 Ind. SW/4 Sec. 18-2-E lying east of Briar Fork of Flint River, & 10 Ac. in 3/2 & 10 a. N/2 NW4 sec. 17-2-1E. Proven 11-3-1818 & DR (Pope) (Note: 10 a. in S/2) purchased by Birdwell from Joseph Powell. Witnessed by: Lewis B. Taliaferro, Jacob Pruett, and Levi Isbell. 1818 1818, Aug. 18 – Madison County, Alabama; John Birdwell and wife Mary deeded land to George. Oglethorpe Gilmer. Witnesses: Lewis B. Taliaferro, Jacob Pruitt, Levi Isbell. Levi Isbell was John and Mary Birdwell’s son-in-law. 1819 In January 1819 John and Mary Birdwell moved to Lawrence County, Alabama where they purchased large tracts of land and were also founders of this church,Birdwell Springs Baptist Church, which later changed its name to Enon Baptist Primitive Baptist Church. They were both established within the Mississippi Territory since Alabama was still a part of the native american nation and not yet a state. The First 200 Years of the First Baptist Church of Huntsville [Alabama] gives the origin of that Enon Church as several years earlier: “All of Enon’s very first members were squatters since the government’s Nashville land office, which handled the sale of Madison County lands, did not even open for business in the Madison County area until August 1810, more than a year after Enon was established. They moved to Lawrence County near Moulton and established a new church. 1820 The 1820 Federal Census Record reads: Lawrence County, AL. The 1820 Federal Census Record in Franklin County, Alabama has John Birdwell listed there as well. He owned property in many places. The 1820 Federal Census Record for Giles County, Tennessee lists a John Birdwell, but this one is John Birdwell’s nephew John (son of Robert) and family His nephew was probably the John Birdwell in Giles County, Tennessee. 1820 John Birdwell was assigned by an act of the Alabama legislature to review the Flint River in Cotaco County (later Morgan) Alabama, from its junction with the Tennessee to its main fork, to see if it was navigable. 3 Dec 1820 “On December 6, 1820, an act of the Alabama Legislature was approved which designated David Parker, Jonathan Burleson, and John Birdwell, or any two of them, to make a careful “review” of Flint River, from its mouth to the main fork therein, and report the practicability of its navigation, the distance examined, and the expense necessary to improve the river for navigation. On the 20th of December an act was approved to incorporate the Flint River Navigation Co. The incorporators were Fleming Jordan, George Taylor, James McCartney, John Sprowl, Stephen Pond, John P. Brown, John Grayson, Dial Perry, David Walker, Ebenezer Byram, Stephen McBroom, William Derrick, and David Cobb, and they were authorized to improve the navigation of the Flint River in Madison County, from Capt. Scott’s Mills to the Tennessee River. Section 2 of the act provided a penalty of $3 for each day a tree cut or felled into the stream so as to obstruct navigation was allowed to remain, the proceeds of such fine to be applied to the improvement of the river.” The Act is quoted in Alabama Genealogical Quarterly, vol. 1, p.216, and also the Alabama Genealogical Society, Inc., Magazine (1976) vol. 18, issue 1-4, p.38. Owen, op. cit., p. 595: “It does not appear that much, if any, work was done under either of these acts. In any event, there was none of sufficient permanence to affect the navigation or other characteristics of the stream at the present time. References.—Acts, 1820. They left this church for a few years and helped organize Hopewell Church near Danville. 1823 In October 1823, one William Birdwell (1766-1823), age 57, was executed at Moulton, Lawrence Co., AL. for the murder of Mr. Rhea. Thought to be the son of John Birdwell’s older brother Robert Birdwell (1751-1815) of Giles County, Tennessee. The two had had a dispute 10 years before. 1828 Lexington (KY) REPORTER, July 23, 1828, p.1 contains a letter John Harris of Moulton, Lawrence Co, AL., to Andrew Jackson on the character of his late father John Harris, Justice of the Peace of Lawrence County. Column 1 cites “John Birdwell, Esq.” among those vouching for him. Column 5 is signed by John Birdwell, Allen Birdwell, and others. John Birdwell received letter of dismission from Enon in 1842 when his wife Mary died and he moved to Texas. He was known to have visited Texas already by 1838 and probably made several other trips between Texas and Alabama. FOOTPRINTS (Ft. Worth Genealogical Society, 1979), vol. 23-23, p. 107 says John Birdwell moved to Rusk Co, Texas in 1845. 1842 George W. Birdwell administered the estate of Robert Bell estate in 1842 in Rusk County, Texas (one book states incorrectly it was John Birdwell). Robert Bell (27 May 1797 TN-13 June 1842 Rusk Co, Tx) was former sheriff of Cherokee County, Alabama. His wife Belinda Scott (b.4 Jun 1795 TN d. 1842) also died in 1842 not long after her husband. 1854 Birdwell family records show that John Birdwell died Feb. 16, 1854, at age 83 years, 4 months, 23 days, in the home of his son, Col. Allen Birdwell, and was buried in the family cemetery on the site. A fairly large number of the Birdwell family was buried in the cemetery, along with some related families and a number of slaves. After the farm had passed out of the Birdwell family, the later owners rather callously plowed the cemetery under. Trees marking some of the graves were cut down, while the gravestones were thrown into a ditch and covered. A partial list of those known to be buried there was supplied by Mrs. Bohannon of Mt. Enterprise, and a descendant of the Birdwell family, and printed. Some burials were recorded in the Birdwell family bible and appear in the book The Mitchells of Linn Flat by Gwenneth Mitchell, including the notation that John Birdwell’s grave is there. The Mitchells of Linn Flat, by Gwenneth Aenone Marshall Mitchell (Austin, 1981), refers to the Birdwell Cemetery on pp. 174, 202, 214 and 215. Page 174: John Birdwell, his grandson John C. Birdwell, and John A. Birdwell Jr. were buried in a row, side by side, “at the Birdwell family burying ground on the Allen Birdwell place, not far from the family residence near Orton Creek,” three miles from Mt. Enterprise. On p. 202: “The cemetery has been abandoned for some years and pine trees grew over it. Some twenty years ago the ground was smoothed over and seeded in range grass.” From Gwenneth Aenone Marshall Mitchell (posted 10-29-1999 on Birdwell List, on Rootsweb.com): “Rusk Co., Texas History by the Rusk Co. Historical Society, 1982: page 112: John Birdwell, “old great-grandpap”, John C., his grandson, and John Birdwell (Old Uncle John) are all 3 buried in a row side by side. John C. in the middle, Grandpap on the southside, and Uncle John on the north side. Lucinda Ross Birdwell was most likely the first buried there. 1809 census shows 2 sons and 6 daughters born 1788-1809. 1840 census shows all children gone from home. 4 f ?Mary Polly c1800-1804? 7 Jane Birdwell 1806- m. Samuel Neal (Jane Birdwell m. 10/27/1825 Samuel Neal (10/29/1825 recorded Lawrence Co. Marriage Book 1A, p.226; Gandrud, p.27); lived there 1830 w/ 1 son under 5. Lived in Panola Co., MS in 1850. It is possible that one of the married daughters and her husband (Romine or Isbell?) was living with them in the 1820 census and there was no son who died young. However, both James Romine and Levi Isbell were born well before 1800 and do not fit the 1810-20 age bracket. 2 George William Birdwell 1811-1831, some lists show him as another son, and some say died at Moulton, Lawrence Co., AL. (confusing him with Moses? ), but he was not in the household in the 1830 census. 3 Matilda Birdwell Jan 20, 1816-d 1895 Bristol, Ellis Co, Tx is on some lists as another daughter, but note that Talitha R. Birdwell’s name is incorrectly transcribed as Matilda by some researchers. The Matilda Birdwell of Bristol, Tx. was the daughter of John Birdwell of Giles Co., Tn. ; granddaughter of Robert and Ellen (Sanford) Birdwell, Robert being the brother of John Birdwell who married Mary Allen. Matilda married in Giles CO., TN. 12 Dec 1834 Neal C. Dever (1802-1878). 4 Judge Thomas Gaines Birdwell b1804 Giles Co, TN was not a son. He was a son of John Birdwell’s nephew John (son of Robert), and a brother of Mary and Matilda above. Interestingly, his son Thomas J. Birdwell’s daughter Pearl married John William Culver, son of Susannah (Culver) Isbell Culver, widow of Zach Isbell, son of Elizabeth Birdwell Isbell Conway. 5 William McElree Birdwell 1837-1906 was a grandson (son of John A. ), rather than a son as some lists incorrectly show. “A Dream Come True, The Story of Madison County and Incidentally of Alabama and the United States, Vol. 1, James Record. (Huntsville: Hicklin County, 1970), pp. 39-40. Posted by Carolyn Murray Greer	| June 21, 2017 | Categories: Alabama, Allen B Birdwell, Birdwell, Birdwell Family, Carolyn Murray Greer, Carolyn Murray Greer, John Birdwell, Lawrence County, Madison County Alabama, Remembering the Shoals | Tags: Birdwell Family, Carolyn Murray Greer, George Birdwell, John Birdwell, Mary Allen, Mary L Looney, Remembering the Shoals | Comments Off on Will you be my hero?